When I was attending Delaware Valley College, I recall that my roommate reacted to his 20th birthday as it were the worst day of the year, like he was one day closer to death; he was noticeably shaken by it. 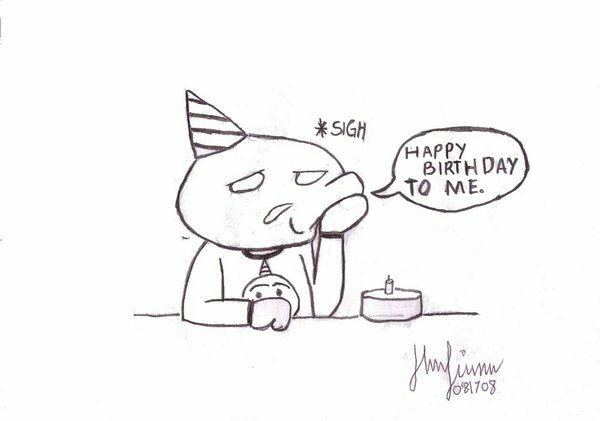 My birthdays came and went without a flicker of interest on my part. Its a number, nothing more. Suddenly I was approaching fifty, and for the first time in my life I wanted to have a party. I was living in Buenos Aires, Argentina, and had been there a few years. I decided that I wanted to invite all the people I'd met that I liked and felt a kinship with. But the purpose of the party wasn't to indulge myself in a me day; it was to be a "them" day. It was going to be my way to say "Thank you for this life journey I'm on, and thank you to for all those that have and are contributing to the richness of that journey." It was the first birthday party for me that I had ever felt immersed in. i liked it so much that I did it again for my 52nd, albeit with a much smaller crowd: very close friends and my Argentine family (Sandra, Carlos, Recardo, Charley, Isaac, Migel, and Adela). This year I'm fifty-five I am still young at heart, somewhat imature in natural, spantaneous and adventureous. But I also am for the first time feeling my age; the bones more fragile, the joints creak, and deep sound sleep no longer comes as easily as it once did. The good news is that according to a new study, middle age in the modern world, they say, BEGINS at 55. Hoohoo! In a recent article they notes that in a survey of 1,000 UK adults aged 50-plus, people said that they do not see themselves as elderly until they are nudging seventy. Previous studies -- according to the article -- pinpointed the start of middle age as early as thirty-six, and I would have to say that if I had been asked, that is what I would have said. Although seven out of ten early 50-somethings quizzed for the survey defined themselves as middle-aged, the average age perceived at which life began was fifty-four . One in five thought middle age becagan at sixty, and one in five also thought middle age was a state of mind. Be that as it may, my bones and joints confirm that middle age is in fact a state of age, not a state of mind.